My desk is a small, white, wooden number with a set of drawers on the left. The desktop is chipped and nicked, scarred and smudgy. I’ve had it for over seven years now. It’s seen me through all sorts of houses and various endeavours – planning festivals, uni essays, story writing, starting this here blog. I brought it up north with me from Melbourne. I first got it when we lived in the small terrace house by the train line. It belonged to a friend of my mum’s and despite its small size, it does have a wide girth and so wouldn’t fit in the front door. We had to rope it in through the front window and so it continued to live in the front room, overlooking the trains and the cars and the raggedy white rose bush in the front garden. These days my desk drawers are full of pencils, random phone cords, the wisdom teeth I had removed four years ago, my passport, all kinds of junk. There’s a pile of books in the corner – short stories by Junot Diaz, some Camus, a second-hand Frank Hardy novel, Judith Butler’s Gender Trouble – and a small pale green succulent with a pink blush in a cream porcelain pot. The desk sits in our lounge room, directly in front of our side window, the one that looks out onto the neighbour’s back garden. Today their impeccably-mowed grass is a faded yellow but the line of trees over their side fence is the same iridescent tropical green that it always is. The sky, usually a clear blue-for-miles, is grey & white with low-lying clouds, a thin beam of sunshine peering through. It’s Sunday afternoon, the light heavy and the day slow and quiet. We’ve been to the park and the supermarket, played with a chook and bought our weekly groceries, and now I’m sitting at my desk typing. The bub is fast asleep on my chest enjoying the late afternoon nap that he’s starting to shake off, reminding me that he is growing faster than I can keep up with. S and W are in the kitchen singing and laughing and putting together a lasagna for our dinner tonight, making the most of the last days of winter by cooking up a hearty, cheesy meal. And the whole house smells of the batch of granola that I popped into the oven a mere thirty minutes ago. When I need a break from porridge and muesli and my everyday breakfasts, I make a batch of granola. It’s surprisingly easy – minimal effort for maximal reward. A little mixing, a little baking, and voilà, breakfast is served. And homemade granola is worlds above the store-bought stuff. ‘Nuff said. I’ve got a go-to recipe that works every time, just swapping around the nuts, fruits and flavours to mix it up. 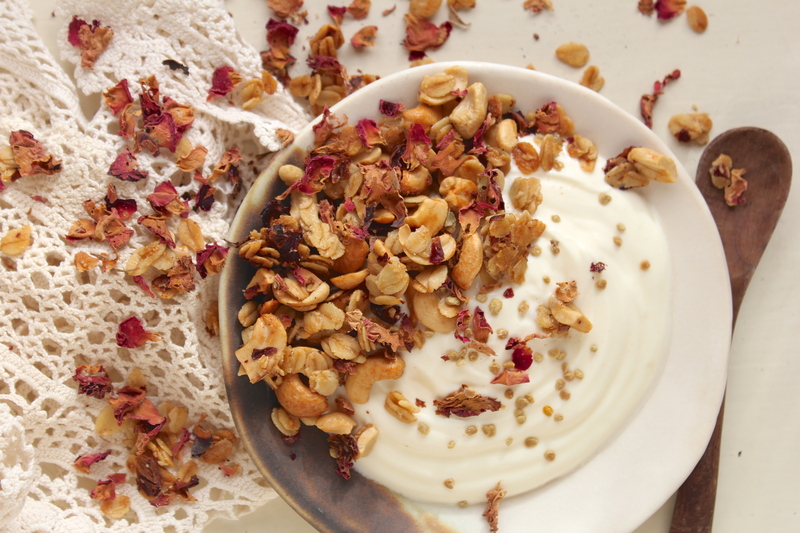 This particular Rose Petal, Cashew & Olive Oil Granola actually came together quite by accident. I intended to quickly make a batch of Coconut Cacao Granola. 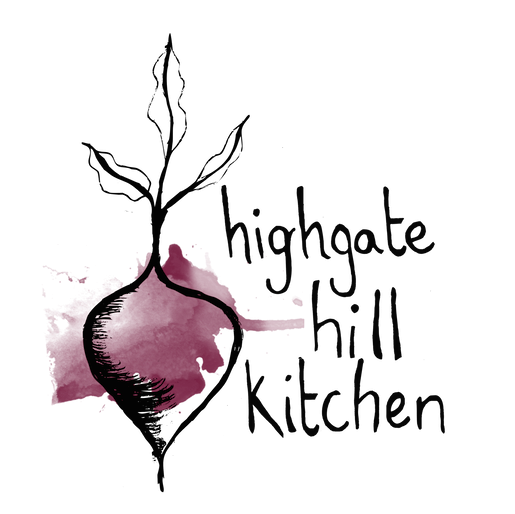 I had everything out on the bench, ready to roll, when I came across a bag of rose petals at the back of our (overly stuffed) kitchen cupboard. And just like that I changed it up. I’m pretty wild that way. I subbed in the cashews for almonds, rose petals instead of coconut, nixed the cacao and flavoured the whole thing with some rosewater to really amp the floral notes. 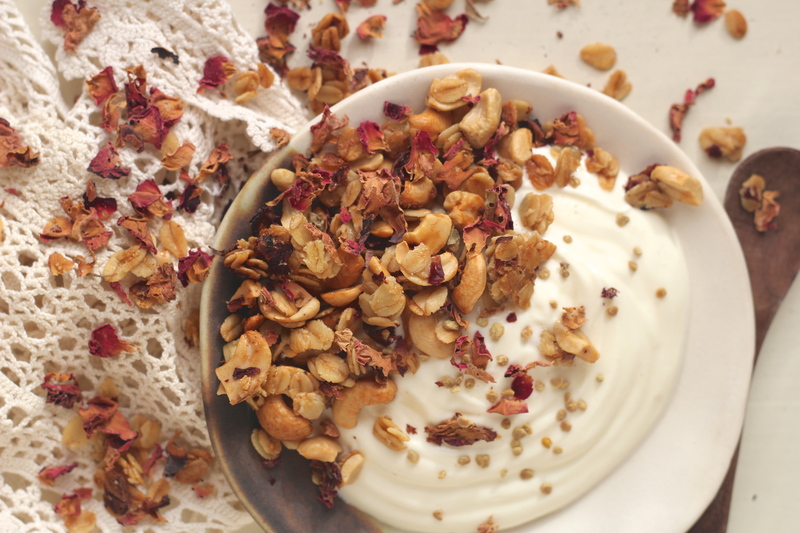 A bowl of this delicate, sweet and crunchy granola is just what I’ve been in the mood for in these last days of winter. It makes for a most lovely start to the day, or a perfect mid-afternoon snack. W likes to eat it by the handful, but I think it is best served with a dollop of rich, creamy yoghurt. Preheat oven to 150° celsius/300° fahrenheit. Line a large baking tray with baking paper and a drizzle of olive oil. 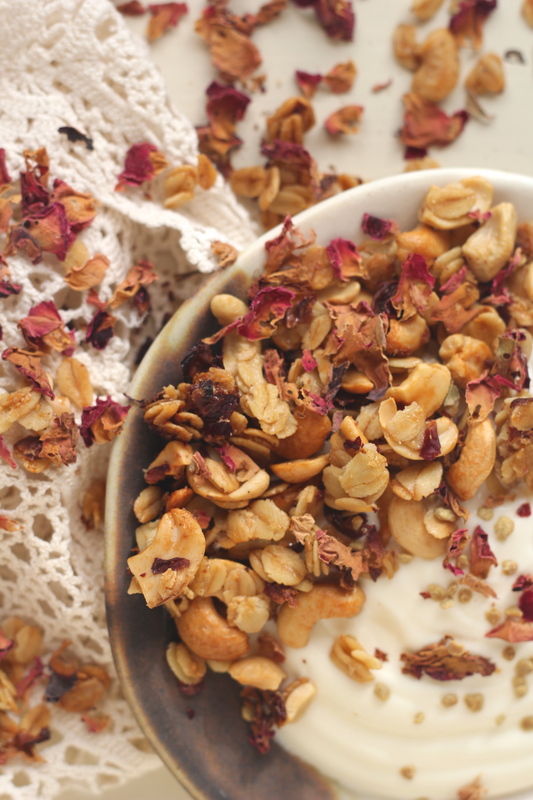 In a large bowl combine the oats, rose petals, and chopped cashews. In a small saucepan over a medium heat combine the olive oil, syrup, sugar and rosewater, cooking until melted together and warmed through. Add the pinch of salt and stir. Pour the wet ingredients into the dry and thoroughly mix through using a spatula or wooden spoon. Transfer to the prepared baking tray in a single layer, pressing down with the spatula to encourage the granola to clump. Bake for 40 mins. then remove from the oven and leave to cool. 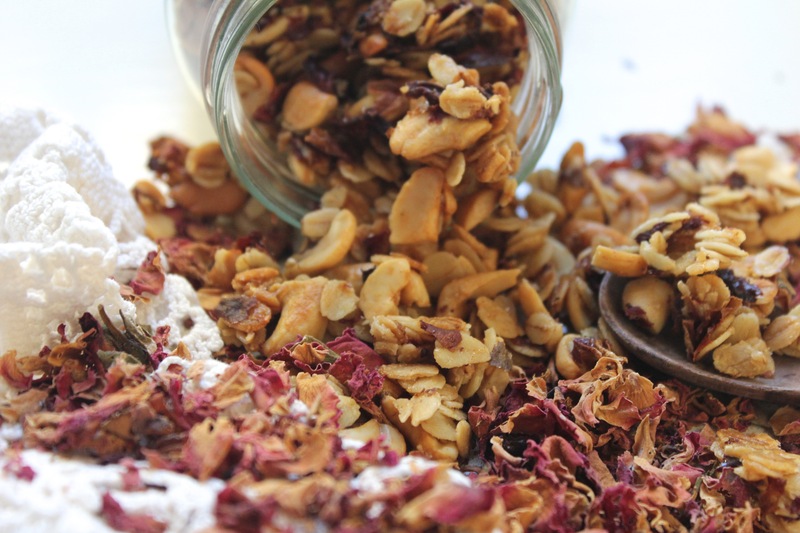 Once cooled, break into granola-sized chunks and store in an airtight container. To serve, mix the yoghurt with the maple syrup and tablespoon of rosewater. Split between two bowls, top each bowl with a third of a cup of granola and half a teaspoon of bee pollen. For the Australian readers the beautiful plate in the pictures above is my new favourite piece, handmade porcelain by Elke Lucas that I picked up last week at The Nook in West End. I love the sound of this recipe – starting your day with rose petals in your breakfast sounds so wonderfully exotic. Also *love* that gorgeous plate. I know, right?! So gorgeous – I just ordered a few of her bowls too. 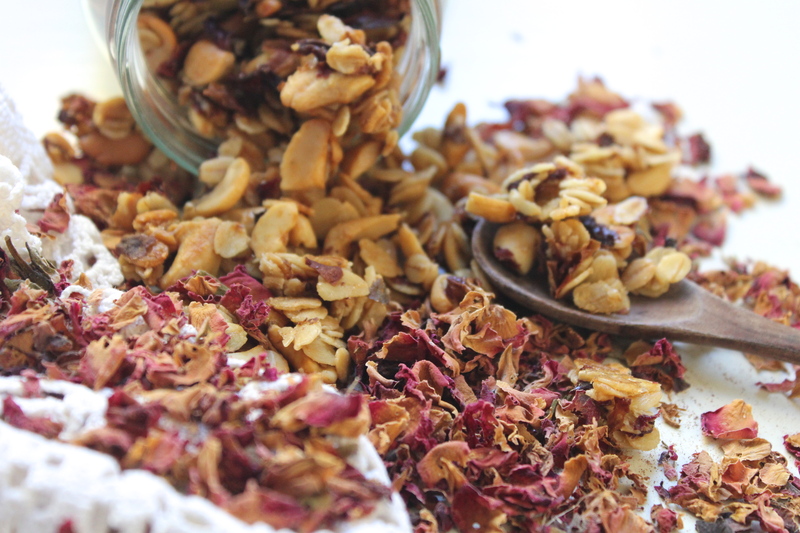 Rosewater (and the petals) are such a thoughtful addition to granola. Definitely trying that next time. Love that you kept this granola simple otherwise. Thanks Katie. 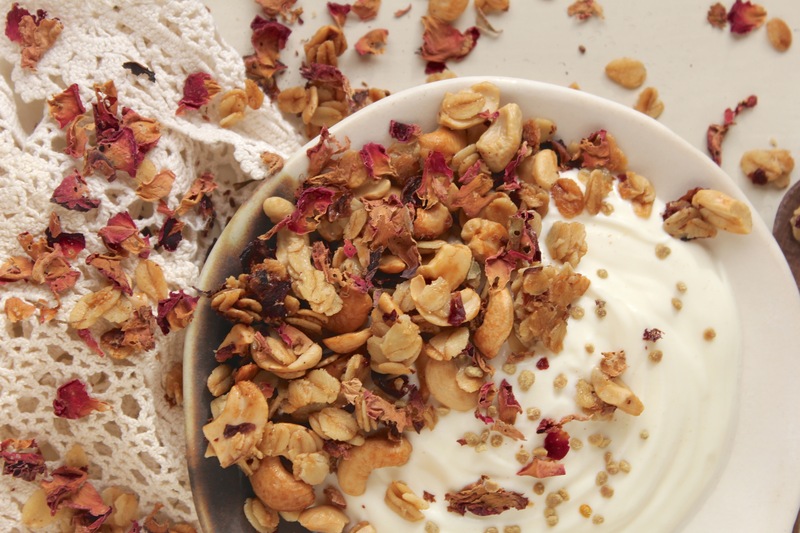 I had a bowl of this granola for lunch today – pretty cheeky but totally delicious! Ha! Cheeky indeed, though I’m sure very satisfying. 😉 And now that I’ve made it myself I know how addictive it is. 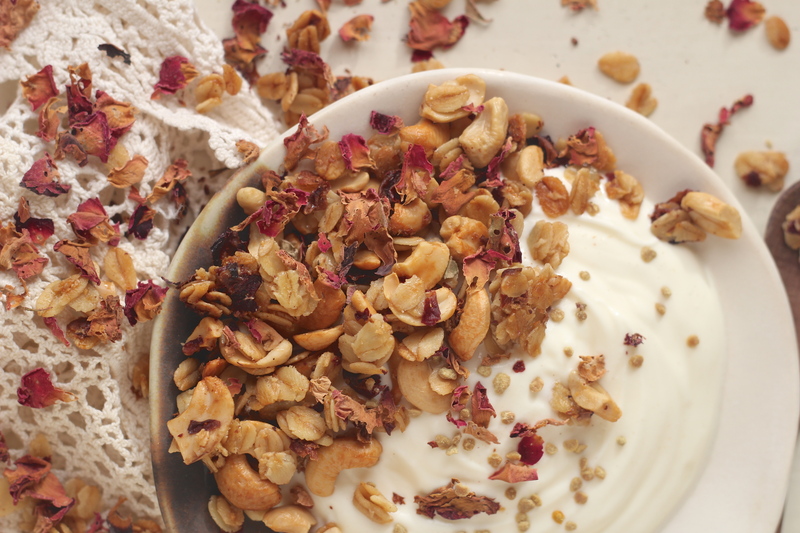 I rarely add cashews to my granola and never rosewater. So this combination is heavenly and a nice change up from my usual tendencies. Thanks Sarah!